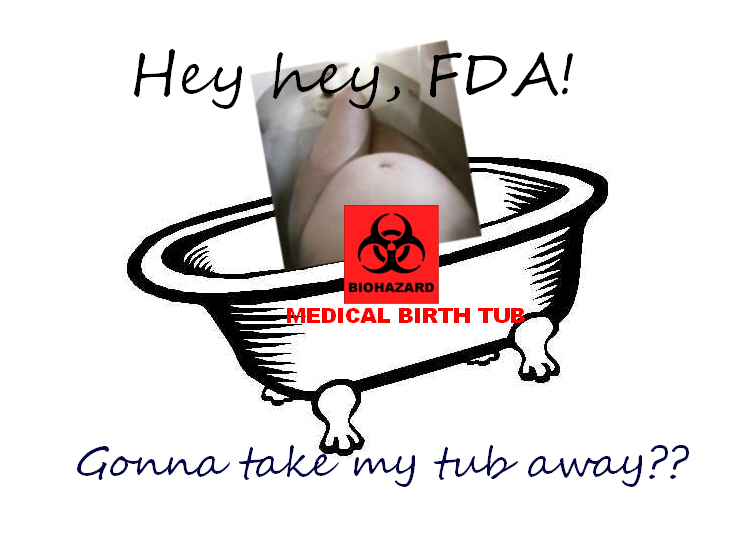 Warning: FDA May Inspect and Destroy Your Bathtub! What’s more, the FDA believes this to be their jurisdiction because childbirth is . . . an . . . ILLNESS. Yes, that’s right . . . I’m ill; ill with child. VERY ill with child actually. So ILL with child, that I might just any day now crawl into my bathtub for relief, medical relief of course, from my nearly 10 month ILLNESS. Harper was told: “Pregnancy is an illness and birth is a medical event. Therefore, a pool that a woman gives birth in should be classified as medical equipment.” Now, I will say that the FDA isn’t the only institution that believes pregnancy and birth to be an illness, but that’s another story for another day. So, when I say that the FDA may want to come into your home and inspect your bathtub, hot tub, pool, pond, toilet, sink, whatever . . . hopefully you can see that I’m not really that far off the mark for these are all things water containers that women may use to facilitate childbirth. More info can be found on this blog as well as Barbara Harper’s Facebook notes. Please spread the news and watch for news of a petition that Harper may be starting on Change.org. Today is a banner day on my Facebook news feed. Here are some things that piqued my interest. I haven’t read this yet, but check out this New Yorker article regarding the decline effect and the scientific method. Homebirth: A Midwife Mutiny is a great blog. I first read Risk, homebirth, VBAC and am now on to her take on a BBC News article about “womb tearing.” Next, I think I’ll read Blaming Women, because HELLO it happens all the stinkin’ time. I’m also curious to read a new-to-me blog today, particularly the article on “No, Actually, You Did Not Turn Out Ok.” We’ll see – I’m a fairly mainstream mama, so I don’t know how I’ll respond knowing that this is one of the blogger’s perspectives: “Where I Post . . . And Kick Your Lily White Arse For Making Your Baby Cry-It-Out.” We ended up doing CIO with our oldest. Is she ok – not completely. Is it because of CIO – not necessarily. Are we ok – no completely. Is it because of CIO – not exactly. But hey, let’s blame ourselves (see blaming women above) and each other (a favorite past-time for some on Facebook) for our kids becoming assholes or freaks as if THEY have nothing to do with it. History: 2 1/2 years ago I had a scheduled c-section with Naomi. I had something called “placenta previa,” which is a “chance” thing that can happen in a pregnancy where the placenta covers the cervix, thus making labor dangerous and a normal vaginal delivery impossible. Because placentas move during pregnancy as the uterus grows, the doctors weren’t sure until we moved back to the U.S. that I had placenta previa. I was put on bed rest to prevent labor at 34 weeks and then advised to plan our c-section for the beginning of my 37th week. Naomi’s birth wasn’t traumatic for me, but I longed to be able to experience a “normal” birth…or at least be given the chance! Even though my c-section was absolutely necessary, I soon learned that many c-sections are not truly necessary, and that many doctors nowadays are absolutely mortified to attend to vaginal births after caesarians (VBACs), due mostly to fear of lawsuits if something goes wrong (the big one being a uterine rupture at the c-section scar). As soon as I found out I was pregnant with Elijah, I began reading everything I could about VBACs so I could do my best to prepare my body for birth and minimize any risk (which, by the way, is only .5% for a uterine rupture – much less than many other “normal” complications women have in first births!). In my research, I was shocked how unnecessary many routine interventions are done in hospitals and how this might affect any woman’s labor. I was determined to not have to go to the hospital, where I would automatically tethered to an I.V. and continuous fetal monitor. So I went the other way and found a CNM (certified nurse midwife) who had just opened a birth center in town and was willing to let me experience labor. If anything were to go wrong, the birth center is only a 5 minute (or less) drive to the hospital, so we felt very secure in our decision and Jeanne’s (my midwife, pronounced “Jean-ie) experience and expertise. I was putting Naomi to bed at 7:30 on Saturday night May 8th when all of a sudden I felt a little “pop” inside me. Pregnancy brings about all kinds of weird feelings, so I wasn’t sure what this was at first, but then when it felt like I had just peed my pants, I had an idea. I freaked out. My due date was May 21st, so this was 13 days before my due date. Of course I was saying I was “ready” for this baby to be due…but was I really READY to do it now?! I checked the fluid – clear. Good sign. It kept coming. I called Jon (who was getting off work at 8). I called my midwife to find out if the fluid could be anything else at all. Nope. My water had broken 13 days before my due date and I had 24 hours to safely have my baby (more than that after the bag of water breaks and you have to start worrying about infection). Wow. This is crazy. I had not felt a single contraction until this point in my pregnancy. Here we go! I was told I could start contractions right away or not until much later, even Sunday afternoon – since we didn’t know what to expect, we called my mother-in-law and asked her to take Naomi for the night, just in case. She came by, her and two of my sisters-in-law prayed for me and baby before leaving (I was still in a bit of disbelief at this point), and they took Naomi to sleep at their house. Jon and I started to watch a movie and relax and rest. I had a meal so I could have some energy if labor started. Light contractions started at 9:00, about 5 minutes apart. I went to bed at 9:30 so we could try and get some rest. Jon slept. I tried but didn’t do a very good job. Contractions stayed at 5 minutes apart but gradually got stronger and stronger. We called our doula Ali (whom we had only met with once before! Our next meeting was to be the following monday!) and midwife Jeanne around 11:45 after they moved to 4 minutes apart and I knew I was going to have to come in within hours. Jeanne told me to call again when contractions became 2-3 minutes apart. Okay. Around 3 A.M. I asked Jon to call Ali over and we called Jeanne. Jeanne told us to meet her at the Birth Center at 3:45. Ali arrived at our house around 3:15 and immediately started helping Jon and I through my contractions. By this time they had become strong enough for me to need to focus intently through each one. I had started moaning through them to help with the pain, too. I had read in several books that this was a good thing to do during labor because of the relaxing, opening effect that open, low tones have on the body. What I later found interesting was that I didn’t really think about doing this as I was doing it…it just seemed like something that was natural and that I should do! And I definitely believe it helped. We left for the birth center around 3:45. We live a mile away from this so I was VERY grateful not to have to be in a car too long. I had one contraction in the car and did not find it very fun. Anyway, we got settled in to the room in the Birth Center room. I was so worried that I would only be at 5 cm dilated or another low number and have quite a way to go. Jeanne checked me. 7 cm. dilated! YES! We’re getting close and I’m almost to transition! Okay, I can do this! I got in the jacuzzi tub next and this felt SO GOOD! With Ali on one side and Jon behind me, I spent an hour in there, where things really became intense. Jeanne had been quietly preparing this whole time, candles were lit, the room was so calm and peaceful. Jeanne also checked the baby’s heart rate every 10 or 15 minutes to make sure baby was doing well (a sudden drop could mean a uterine rupture or other complication). Heart rate was perfect every time. Awesome. I had brought a bag of snacks and drinks to eat/sip during labor and then, ironically, all I wanted was ice cubes throughout the hardest part of this labor! They were heaven in my mouth – truly. After about an hour, Ali suggested I get out for a little bit to change positions again. At the same time I felt it was a good idea, I went through another contraction and OH! TIME TO PUSH! I had spent my entire transition (dilating from 8-10 cm) in the tub. Perfect! We slowly made it over to the bed, Jeanne checked me to confirm we were there (at least I think she did…things kind of got fuzzy around now). Okay, it’s go time. Pushing was hard, and since this was my first birth, it was definitely 2 steps forward one step back. I was holding on to Ali and Jon’s hands really hard. Pushing was the most intuitive thing I have probably ever experienced. My body was working, doing what it needed to do, and it didn’t seem as if there was any other option than to just let it push. It wasn’t my decision – it was simply time to push! No stopping this train! I’m not exactly sure how long I pushed – 45 minutes to an hour, possibly. I had no concept of time at this point. At times Jenny the nurse would put a mirror down so we could see Elijah’s head as he slowly emerged. I didn’t want to look at first but it ended up really helping me focus. My baby was coming, and I was ready to meet him! Elijah David King was born at 6:29 in the morning. Jeanne immediately put him on my chest; he started crying and it was the most amazing feeling in the world. We had done it! I had had no drugs whatsoever, felt every sensation, and was constantly in the moment, aware of my baby and the sheer power of my body doing what God intended it to do. Elijah was messy, beautiful and alert. Just amazing! I can’t describe it. Nothing had gone wrong and I feel so extremely blessed. I got my VBAC! I trusted my body and our first son was born without complication with him or me (or Jonathan’s hand…poor guy, I was gripping so hard there at the end). I pushed out the placenta (piece of cake!) then Jeanne spent some time stitching me up (I had a 2nd degree tear…not too bad. Still a little sore as I write this, though). Jonathan, Elijah, and I laid there in the bed for quite a while, bonding and admiring each other (me still in a little bit of disbelief that I had pushed that head out of me…so amazing what the human body can do!). At least 30 minutes later, we were ready for them to clean up Elijah, so Jenny took him and weighed him (8 lbs even!) and cleaned him off and gave him back to us. We tried nursing and he immediately latched on – I had so many problems nursing Naomi so this was such a relief. I got some ibuprofen to help with my sore bottom and the strong uterine contractions (still having those a few days later as it takes 2 weeks for the uterus to return to normal size). My mother-in-law, Naomi, and a few of my sisters-in-law came and visited us a little later, bringing blueberry pancakes, eggs, bacon, and fruit. It was wonderful. Jon took a nap (figures…wimp!) but I couldn’t sleep yet. Jonathan and Ali were amazing – they supported me and cheered me on through the entire labor, moaning with me, breathing with me, telling me I was doing a good job, etc. It seems so simple, but helps so incredibly much. Who knows how much longer my labor might have been without the wonderful positive support! We left the Birth Center around 11:45 in the morning to go home, only five hours after Elijah was born. I walked to my car, feeling sore but wonderful, still on a natural high from giving birth naturally! Elijah’s birth was the very first VBAC at this birth center! Now, two days later, I’m still getting reacquainted with nursing, still a little sore and tired, but feeling great. Elijah’s doing so well, too, and we are completely in love with our new baby. Naomi seems to be taking well to baby brother too! She likes to come kiss him and gets concerned when he cries or she thinks he doesn’t have enough blankets. I love our little family and we feel so blessed to welcome our new, incredible miracle. The weekend is an excellent time to catch up on the latest news. Here are some things rolling around the internet that piqued my interest. AMA Scope of Practice Initiative Advances – I get so focused on what ACOG and the AMA is trying to do to childbirth, that I forget the far reaching affects of their actions. This post was written by the American Optometric Association. I think it’s a good one to study to get another perspective on expanding SOPP. Plus, it makes me thing that we need to forge ties with other “secondary level” practitioners, hire our own marketing teams, and put together a real professional campaign against the AMA. It’s so hard for me to recognize peace around me, and, in a way, to embrace the healing and transformation that is promised by embracing peace. I keep being led to practicing mindfulness, peace, meditation, yoga, being present, but I keep resisting it. How about you? And will you also take mamascoffeetime’s challenge to practice yoga? If you have a little one at home, try the Animal Adventure! I found a petition, “Practicing midwives Should Be Licensed and Carry Insurance.” I sighed in sadness and exasperation when I read it. It really stinks that this family lost their baby in this manner, but shouldn’t they have been aware through the interview process if their midwife was licensed and if she carried insurance? I’m not trying to point fingers back at this family, but these are such basic questions. For some homebirthers, it’s important that their midwives carry the proper credentials. Others recognize that midwives don’t always care about formal recognition for what they do. They help babies and their families at one of the most critical and beautiful times in their lives. A piece of paper doesn’t mean that they’re a good or bad midwife any more than a medical degree ensures that you have a good doctor. And to require midwives to carry insurance is to ask them (and us) to continue to support a system that is completely FUBAR! Anyone who has suffered from major medical problems – even if they have “good” insurance – can attest to that. Choices in Childbirth Statement Encourages Options and Evidence in Maternity Care. What a concept, eh? Options for women and their babies? EVIDENCE when it comes to maternity care?? Here’s a taste, but please do read the whole thing! I wonder if ACOG or the AMA will respond? A wonderful post at BlogHer, It’s lonely out here: planning for a natural childbirth. Some great comments too! CfM Grassroots Network: MEAC Needs Our Help! What they really need is our $$. And last but not least . . . a new website and blog to which I will subscribe: The Unnecessarian which I found via CfM and Birth, Interrupted. Read the latest blog entry and you’ll see that they’re already holding the medical community’s feet to the fire. The FDA released a list of drugs that they consider to have the potential for serious risks or drugs that have new safety information identified by adverse events. Since when is a cytotec (misoprostol) rupture not serious enough in terms of risk or adverse event to warrant being placed on a FDA-issued alert? GROSS OVERSIGHT . . . or perhaps it’s safe to say that this information is being suppressed by the medical machine? For those of you who may not know, Cytotec is an ulcer medication that is misused to induce labor. Women know to ask for it; doctors know to prescribe it – it’s so easy. However, it can cause overstimulation of the uterus leading to emergent cesarean delivery, uterine rupture, hysterectomy, and even death (of baby and/or mother). It is absolutely NOT appropriate to use this drug on a pregnant or laboring woman. I am not seeing this on a previous AERS list. If it is there, please do let me know via comments. Regardless, it should remain on this list until its use on pregnant women ceases. Not that I’m voting Republican, but I am curious to know anything about Sarah Palin. Who is this woman and how did she secure the VP slot on the Republican ticket? Here are my guesses: (1) She’s such a nobody that when McCain loses, no Republican with a political future would be sacrificed and (2) Should McCain/Palin pull out a win, they have Alaskan Oil in their pockets. But I digress – read this post at Jezebel about Sarah Palin’s brand of feminism. I don’t mean to be polemic, and well, when you hear it enough times, it ceases to be polemic and looks more like the down-low on shadiness. Researchers from the University of Connecticut released a study which looked at the relationship between cesarean rates and malpractice rates. No, we can’t seem to win, especially those of us who have already been cut once. To put our babies through a “trial of labor” is considered irresponsible and reckless at best by a growing majority of care providers and the general public. And finally, I’ve never liked Dr. Phil. I’ve watched enough of him on TV at various times in his career to know that he has nothing new to add to my knowledge base. I find him to be a subversive character – wish I could remember the exact moment I decided that, but it was many years back and had something to do with him blaming a wife (in front of her husband) for their marital distress. I don’t know who was at fault, but Phil pinned the whole thing on the wife and was using this icky patronizing tone. Ick. DO YOU REGRET HAVING A HOMEBIRTH? Be sure to be specific and include details! Here’s an idea – instead I recommend flooding the Dr. Phil show with letters about how wonderful homebirth can be, how difficult VBACs can be to achieve within a hospital environment, and how the current maternity system ruins natural childbirth.